THIS WILL INSTALL THE FRONT/REAR TRUNNION RIVETS AND CENTER SUPPORTS. It will not install the trigger guard rivets. Are you ready for a completely new riveting tool? This is based on Plinker's original riveting jig as well as a modification from another AK gunsmith and upgraded with my own special touches. The large round ram and the ram arm are made from 4140 alloy steel and heat treated. There is only one ram that presses the rear of the rivet and it is captured so it won't pivot left or right. The ram will reach the rear rivet on the underfolder/sidefolder trunnions. I have designed the rivet head supports and dimpling tools after the parts made in the aircraft industry. The dimple tool is stepped so that if you press it in too much it won't leave any marks that will be visible after installing the swell neck rivet. The rivet support is rounded off to keep from having a dent put into the receiver from using small rectangle blocks with indentions for rivets. There will only be one size made for the rivets that I sell. When I put these up for sale I will offer rivets at a discount when you buy the jig. THIS WILL INSTALL THE FRONT/REAR TRUNNION RIVETS AND CENTER SUPPORTS. It will not install the trigger guard rivets. The picture above also shows the long riveting part of the new jig. 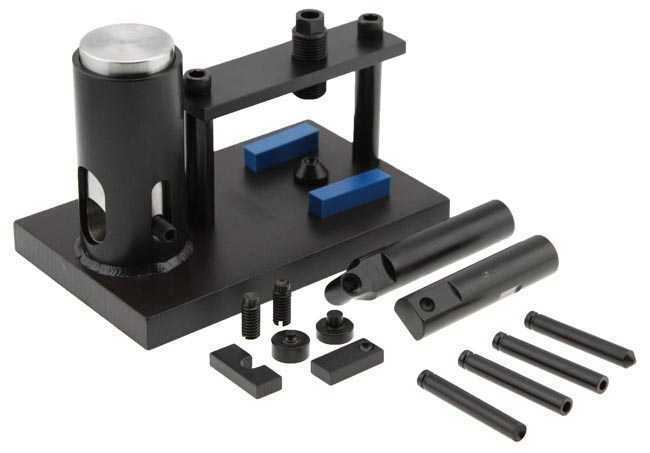 This uses the same basic design as Plinker's long rivet jig. The rivet centering tools and head forming tools are basically the same, but will be modified slightly. With this tool you can install the long rivet on the front of the Yugo/RPK bulged front trunnions. It will even let you look at the head as it's being formed so you can see what it looks like before removing the receiver from the jig. The key to having a nice rivet head is centering the ram over the rivet before forming the head. The long rivet jig is the best way to set the center support rivet. I've tried it with the regular jigs before and it has a tendency to crush the rails around the center support. The way this tool works it focuses all of the energy in a straight line down into the rivet and will consistently work better than any other method. It may not be as fast as just hitting the rivet with a hammer, but it will form a much nicer rivet head. Rivet Sets are $6 per set for people that order the tool from my website, not from other companies or used from an individual. To get the rivets for $6.00 all you have to do is log into your account then go to the rivet page. If they don't show the $6.00 price then I will need to change your account status to give the discount.